Though Wire have radically reinvented themselves in the past, Nocturnal Koreans finds them aiming their formula just slightly to the left. Colin Newman of the English rock band Wire warned me last year that "we're thinking about the next one already. Songs can happen very fast." Eight songs that the band wrote but excluded from their self-titled 2015 album have gone through the refinement phase and are now being released as Nocturnal Koreans. From a glance, it appears that these eight songs didn't fall far from the Wire tree, but the band's attention to detail and Newman's recording studio expertise work together to give this batch of a songs a subtly different flavor. Wire aren't reinventing their collective wheel yet again so much as aligning it in a different direction. Newman puts it this way in the EP's press release: "The WIRE album was quite respectful of the band, and Nocturnal Koreans is less respectful of the band." What he means is that WIRE is the sound four guys playing together in one room at the same time. 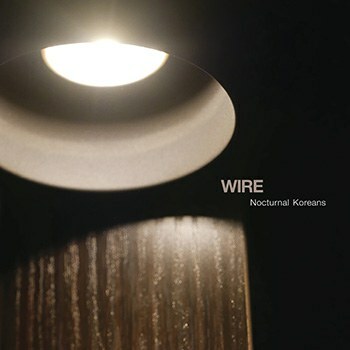 In turn, Nocturnal Koreans finds Wire futzing with the songs largely from the control room. Fear not, traditional Wire fan, this does not result in heavily abstract numbers à la Document & Eyewitness. Only one song exceeds four minutes and length and the remaining seven get to their point within the first ten seconds. In less than half-an-hour, it's all over. But during your brief time together, Wire treats your ears with Matthew Simms's lap steel and trumpet, Robert Grey's distorted drum kit, and a major chord construct deliberately designed to sound a little dopey. The one glaring exception is a near-five-minute drum-less crawler named "Forward Position", capturing the band in their typical rule-bending mode. Here, tunes with zoom give way to ambience with tension as Newman hauntingly reminds you that "I am black box, I remember / Every promise that you broke." Yikes. It's good thing that we have tracks like "Dead Weight" to give us all a little balance, spinning the electric guitars upward to a miniature euphoria while inviting us to "glide like butterflies". "Still", the bouncing bubble of major chords, gives the unfortunate impression of a Wire castoff -- one better suited for Newman's side project Githead. Hey, they can't all be killer. As is the case with most Wire albums, they sure can hit the proverbial mark when they're willing. "Numbered" is the EP's shortest and most frantic cut, using a guitar riff to slice the air from the very beginning. The lyrics "you think I'm a number / Still willing to rhumba" are a rare acknowledgement of the band's past (it's often been said that Wire only faces forward), as is the mention of "trash to treasure" in "Internal Exile". Placed second on the EP after the title track snaps the band into sleek action, "Internal Exile" sounds like a death waltz as Newman ominously intones the word "March" on every other bar in the song's chorus. Towards the end of Nocturnal Koreans, things get even more interesting. "Pilgrim Trade", while not a barnstormer by Wire's standards, is a mid-tempo slab of noise that allows for Grey to strike something on his drum kit that has a sinister, metallic ring to it. Bassist/lyricist Graham Lewis takes over lead vocal duties for the EP's final number "Fishes Rings", a song that is difficult to define both musically and lyrically. He delivers the closing mantra "I'm counting rings in fishes bones" like it's a dangerous proposition, one that guarantees your loss. The music does its best to keep a level head while giving the impression of insanity. In the future, Nocturnal Koreans will most likely be regarded as a transitional release. Ever since Bruce Gilbert exited the group, this 21st century incarnation of Wire has been making headway with a formula that promised consistent results through their muscular music. Now, Wire has gone and slightly tinkered with that formula. As Robert Christgau "rather flatteringly put it back in 1991, "Now let's hope they devolve."